The New Jersey State Bar Foundation (NJSBF) will present its highest award, the Medal of Honor, to Linda R. Feinberg, a retired superior court assignment judge in Mercer County, and Justin P. Walder, a partner at Pashman, Stein, Walder and Hayden. 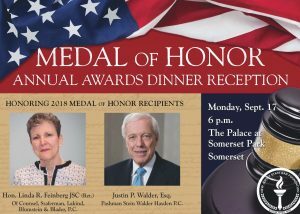 The award, given each year to those who have made exemplary contributions to improving the justice system and enhancing New Jersey’s legal legacy, will be presented at the Foundation’s Annual Medal of Honor Awards Dinner Reception on Monday, Sept. 17 at The Palace at Somerset Park in Somerset. Walder and Feinberg were named this year’s honorees by the Foundation Board of Trustees, led by Newsome, Feeney, and additional executive board members Norbert A. Garcia, second vice president; Kathleen N. Fennelly, treasurer; and Charles J. Stoia, secretary. Judge Feinberg began her legal career as a labor attorney with the U.S. Department of the Army. In Jan. 1975, she was appointed as an assistant prosecutor in Mercer County, and joined the faculty of The College of New Jersey (TCNJ) in 1977, as part of the law and justice department. While teaching at TCNJ, Feinberg entered private practice and was also appointed a municipal court judge in Lawrence, Hopewell and West Windsor townships. In 1988, she was appointed presiding judge of the municipal courts in Mercer County. In 1992, Governor James Florio appointed her to the New Jersey Superior Court. She served first as the presiding judge of the family part in Mercer County and then as assignment judge for the Mercer County Vicinage. She served in that position until her retirement in 2012. Shortly afterwards, she returned to private practice of counsel with the firm Szaferman, Lakind, Blumstein & Blader in Lawrenceville. Walder received acclaim for his professionalism beginning early in his career. In 1971, he was recognized by the New Jersey State Bar Association as the Outstanding Young Attorney of New Jersey.­­­ He began his career as a deputy attorney general, successfully defending the constitutionality of the Sunday closing laws. He went on to serve as an assistant Essex County prosecutor, where, as the chief of economic crimes, he prosecuted the largest Ponzi scheme in the state. Currently co-chair of the litigation department at Pashman, Stein, Walder, Hayden, he notably represented a superior court judge in a case where the New Jersey Supreme Court agreed that the Pension and Healthcare Benefits Act violated the New Jersey Constitution. In 2016, he successfully argued a New Jersey Supreme Court case that led to the immediate reinstatement of a lawyer who had been disbarred. Walder has volunteered for countless educational seminars and served in a number of professional organizations, including six years as state chair of the Fellows of the American Bar Foundation.